(green). Blue pseudocolor = DRAQ5® (fluorescent DNA dye). Flow cytometric analysis of Jurkat cells (blue) and MCF-7 cells (green) using E-Cadherin (24E10) Rabbit mAb (Alexa Fluor® 488 Conjugate) (solid lines) or a concentration-matched Rabbit (DA1E) mAb IgG XP® Isotype Control (Alexa Fluor® 488 Conjugate) #2975 (dashed lines). Monoclonal antibody is produced by immunizing animals with a synthetic peptide corresponding to the sequence surrounding residue 780 of human E-cadherin. 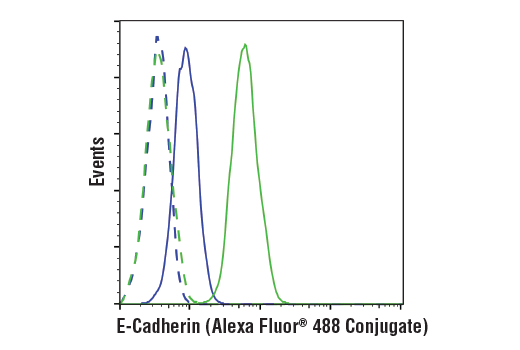 The antibody was conjugated to Alexa Fluor® 488 under optimal conditions with an F/P ratio of 2-6. 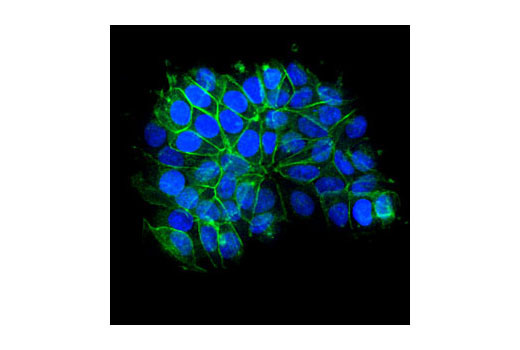 This Cell Signaling Technology antibody is conjugated to Alexa Fluor® 488 fluorescent dye and tested in-house for direct flow cytometry and immunofluorescent analysis in human cells. The antibody is expected to exhibit the same species cross-reactivity as the unconjugated E-Cadherin (24E10) Rabbit mAb #3195.